Our mission is to advise and support our students as they consider their futures beyond Deerfield. In our student-centered College Advising process we urge students to be self-aware as they explore their full range of options. We assist them in preparing authentic applications that highlight their talents and accomplishments. All of our work is guided by Deerfield’s core values, honesty, and respect for others. 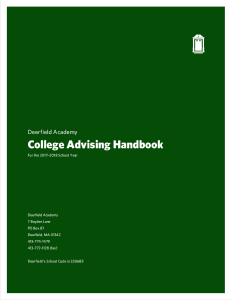 For contact information and frequently asked questions about College Advising at Deerfield, please visit the College Advising Department page.